I'm thinking about plans for the master bedroom and I'm inspired by this room today. 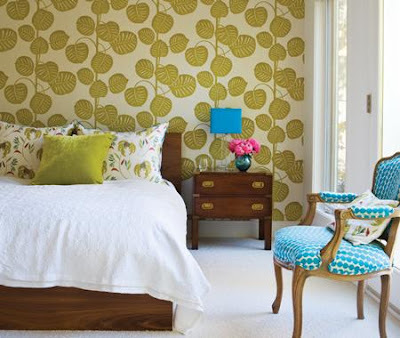 The bold wallpaper and bright table lamp and chair are lovely. It seems my laptop has the sniffles as well. I'll be back with a proper post when I can work out what is happening. In the meantime I wanted to thank you for the lovely comments left for me on my studio makeover. I spent yesterday a little embarrassed and nervous about what you might think of it. I can be shy like that sometimes but THANK YOU. The studio is the one area in our home where I could be let loose to do with as I pleased (within budget), decorate to my own taste and probably break every design 'rule' in the process. But hey, it was fun.